The Buffalo State Hospital, also known as the “Buffalo State Asylum for the Insane”, “H.H. 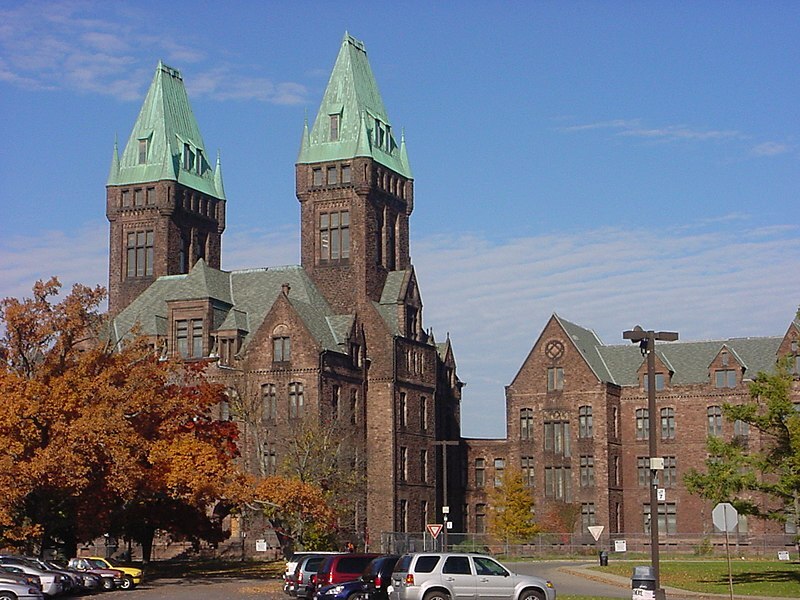 Richardson Complex”, “Buffalo State Lunatic Asylum”, and “Buffalo Psychiatric Center”, was built in 1871 with two medieval-style towers under the name Buffalo State Asylum. The appearance of the hospital has been compared with that of Danvers State Lunatic Asylum. In 1870, Henry Richardson was assigned with the task of designing the hospital, which gave him the chance to show off his architectural style that would later become known as Richardsonian Romanesque. Like many asylums of the time, the Kirkbride Plan was utilized, meaning that the asylum had to consist of five wards that step out on either side of the central administration building. Patients were sorted out by gender, and the most dangerous or criminally insane patients were put in the tips of the wings in order to keep them as far from administration as possible. The wards were separated by the curved, catacomb-ike hallways, and the building was topped with a copper roof. In the case of a fire, there were massive iron doors to isolate a ward. Most of the building materials in the hospital were Medina sandstone, which gave the buildings their dark color. In 1878, budget issues forced Richardson to use brick on the three outer wards. The 185-foot-tall towers and the male wing opened in 1880, and the female wing followed fifteen years later in 1895. The building’s construction was completed in 1895, even though Richardson had died nine years before in 1886. Like many hospitals during the late 19th century and early 20th century, the patient population soared while the work force fell. This harmed Dr. Thomas Story Kirkbride’s original plan of a peaceful, happy, and sanitary mental hospital. The maximum occupancy was exceeded in the thousands, forcing some of the patients to sleep in the halls or outside. The east side’s brick wards were eventually demolished in the 1960s to make way for a new building. The main Kirkbride building’s patients were removed and transferred to other mental hospitals in 1974. A year later, the hospital was renamed Buffalo Psychiatric Center, even despite the hospital had closed. Eventually, plans were made to the administration building as a school. Construction and asbestos abatement equipment were brought onto the property, but nothing ever became of the building. The government of Buffalo, New York kept the building up rather than tearing it down for housing developments. Every night, they used lights to illuminate it, and used Plexiglass instead of boards to protect the windows. Overall, they kept a close eye on the building. However, in April, 2010, a fire greatly damaged the hospital. It is highly theorized that the hospital is haunted due to the fact that there was so much suffering. Since the building has been mostly fixed, tours are now available. It is expected to become a hotel by 2015. The buildings are being turn into a hotel. Open date to be in 2015 if everything goes right. 🙂 Tours are available.